What a day of contrasting emotions for England in the third Test against West Indies in Barbados. On one hand, there was sheer delight for captain Alastair Cook as he finally ended his century drought with a tough, determined hundred; on the other hand, the tourists finished day one firmly on the back foot, amid despair for Cook's opening partner Jonathan Trott. I thought Cook batted really well for his 105: he played with great determination, an instinct for which balls to play and which to leave, and his foot movement was excellent. By contrast, Trott looked nervy and it is clear that his forward movement towards the short ball has become a fatal technical flaw. He can no longer continue to open the batting. That is the harsh reality of international sport: some careers can be revitalised by a brilliant innings while others must come to a sad end. Cook's century was hugely significant, both for himself and the team. He has been scoring plenty of runs of late, but hundreds are important milestones for batsmen and for someone who was so used to reeling them off, to go two years without one must have eaten away at his confidence. You could see in his reaction just how much it meant to him to finally get the monkey off his back, and surely all this negativity around him can now be finally put to bed. Cook is never going to be a batsman of great aesthetic beauty, but you don't need your openers to be free-scoring - you've got middle-order players like Moeen Ali for that. Cook's great virtue is that he's a tough nut to crack, and that's what makes him an ideal opening batsman. 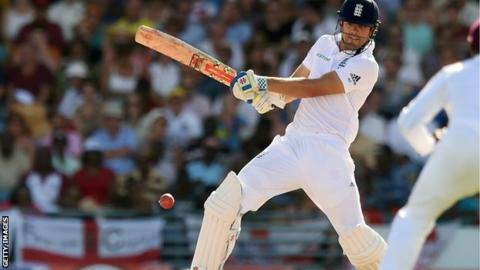 "Cook played splendidly, he fully deserved his hundred. He's been good for the team to bat all day when wickets have been going throughout the day. I watched his feet, he was going back and forward and above all he played straight. With concentration, patience and footwork like that he will always make runs in Test cricket." Yes, he made mistakes. He ran out Moeen and he played a poor shot to lose his wicket just before the close, but he batted all day in 100 degree-heat while wickets were tumbling around him. That showed an immense amount of fortitude. If people still want to be negative about Cook, I'm afraid they've got a problem. The real issue is that Cook now needs an opening partner for the summer Tests against New Zealand and Australia. It is time to acknowledge that the Trott experiment is over. He has had a mighty fine career for England and it's a shame that it's ended like this, batting out of position and being asked to do a job that doesn't come naturally to him. Since the middle order is performing so well, there's no way back for him now. It's a dreadful shame for Trott personally, but at least England have a definitive answer. If Adam Lyth had come in for this match and failed, and Trott had gone away and scored runs for Warwickshire, that could have clouded the issue. Now it looks as though Lyth will have to come in and face two world-class bowling attacks on English wickets - not an ideal situation, but one that England will have to deal with. Before that, they have plenty of work to do to ensure that they win this series. West Indies are definitely ahead of the game after the first day - when you win the toss and choose to bat, you don't expect to be 240-7 at the close. But I don't think the pitch looks as good as everyone expected - it's a dry and uneven, with a bit of early spin. If England can get up to 300, this match will be very evenly poised.